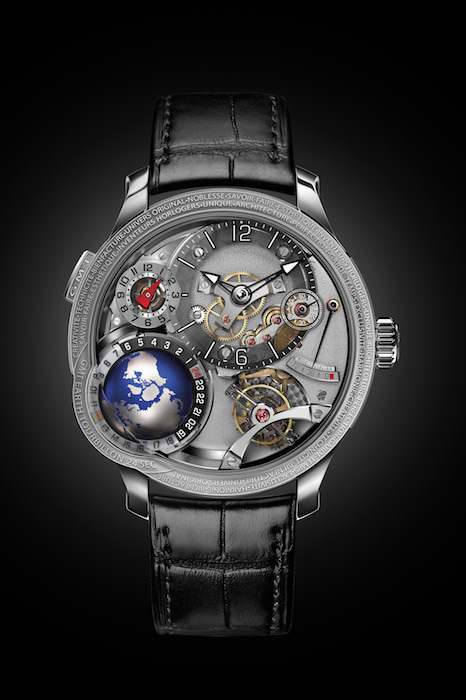 You might think that a watch as technically accomplished as the Greubel Forsey GMT comes from a centuries-old lineage. Not so. The reality is that this impressive model was only launched in 2011 — barely seven years ago. At the time — despite their already ambitious design brief — it constituted Greubel Forsey’s first foray into non-tourbillon complications, a bravura display of the company’s skill as applied to world time discs and miniaturised globes. This year, the La Chaux-de-Fonds manufacture are once again updating that design with the GMT Earth; rest assured — the new release retains all the madcap flair we’ve come to expect. The GMT Earth is a veritable fortress of complications. In profile, the wearer’s eye often strains to take in all the detail: including a two time zones; a miniature globe; and proprietary tourbillon. 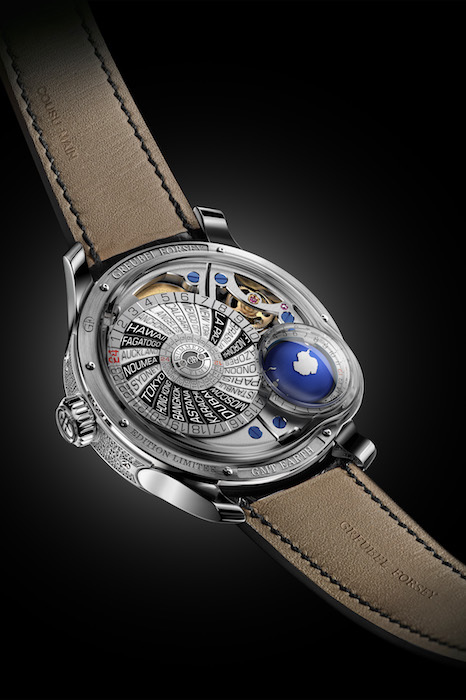 On its caseback, the Greubel GMT boasts a world time disc and 360 degree views of its miniature globe. The GMT World is an unabashedly loud watch, but look past its seemingly chaotic visual design and you’ll be rewarded with numerous details worthy of closer analysis. This particular take on the GMT features a white-gold case engraved with Greubel Forsey’s “statement of purpose” and multi-level chapter ring manufactured using synthetic sapphire crystal. Deployment of these rare elements certainly invokes the “just because we can” attitude frequently associated with Greubel Forsey. But more importantly, it serves the broader purpose of making the dial’s composition complex and fresh. And what composition it is: akin to a certain miniaturised landmass from the title sequence of everybody’s favourite HBO show. The base dial, decorated with a sand-like brushing effect, sets the stage for layered visual depth that is diligently repeated throughout the timepiece: the secondary timezone, tourbillon cage and rotational globe all inhabiting different rungs on some sort of magical 3D map. Add to that the phenomenon of motion (when the GMT World is strapped to the wearer’s wrist) and you have yourself a fine feat of technical wizardry. 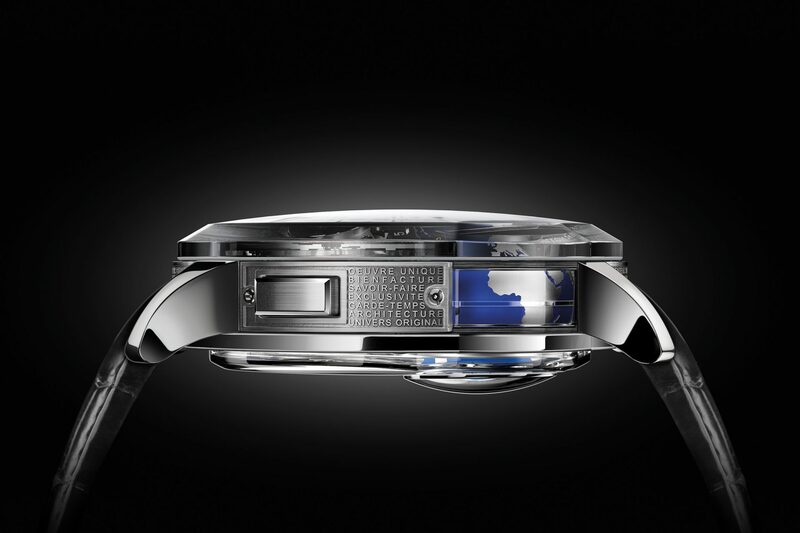 The GMT Earth is produced in a limited run of 33 pieces. It is priced at approximately US$611,280. For more, visit Greubel Forsey.